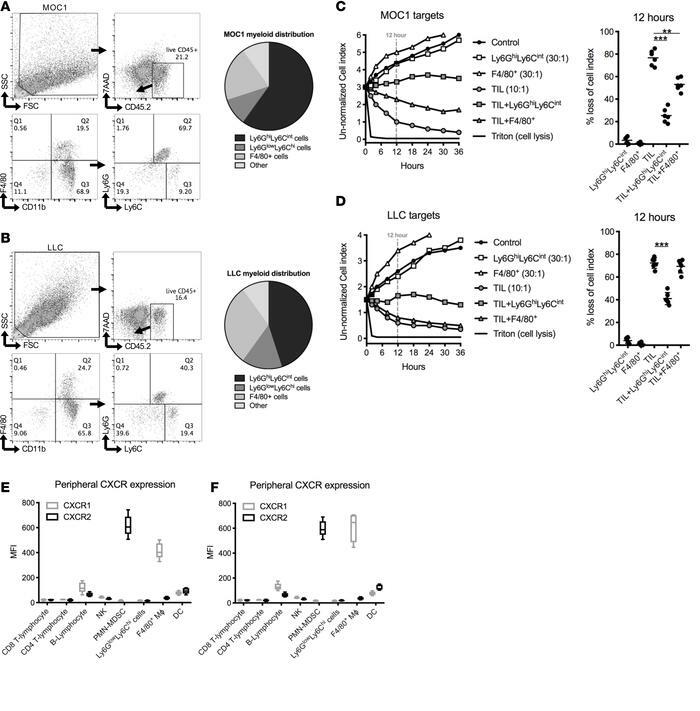 Tumor-infiltrating CXCR2+Ly6Ghi myeloid cells suppress TIL function to a greater degree than CXCR1+ macrophages. Day 20 tumors from wild-type (WT) B6 mice bearing MOC1 (A) or LLC (B) tumors were digested and assessed for infiltration of myeloid cells by flow cytometry. Representative dot plots of gating strategy on the left, with pie graphs of myeloid cell constituency on the right. Ly6GhiLy6CintF4/80– myeloid cells or F4/80+ macrophages were sorted from MOC1 (C) or LLC (D) tumors and assessed for ability to suppress TIL (10:1 E/T) killing of parental tumor cells. Ly6GhiLy6CintF4/80– myeloid cells or F4/80+ macrophages were plated at a 3:1 ratio to TILs. Representative impedance plots shown on the left, with quantification of percentage loss of cell index at 12 hours quantified on the right. CXCR1 and CXCR2 expression on MOC1 (E) and LLC (F) tumor-infiltrating immune cells was assessed via flow cytometry. Representative data from 1 of 2 independent assays with similar results shown. MFI, mean fluorescence intensity. *P < 0.05; **P < 0.01; ***P < 0.001 by ANOVA. n/s, nonsignificant.